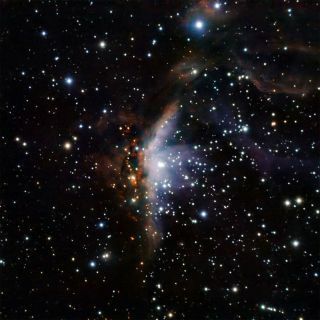 The Gum 19 star-forming nebula, as photographed in the infrared by the European Southern Observatory’s New Technology Telescope at the La Silla Observatory in Chile, appears half-light, half-dark. Astronomers have captured a new photo of a two-faced nebulathat appears dark on one side and bright on the other. The new photo shows a striking view of the nebula, which is a gathering of gas, dustand stars about 22,000 light-years away from Earth. The little-known celestialobject, called Gum 19, is illuminated by an extremely huge, hot star calledV391 Velorum. The surface temperature of this star is a scorching 54,000degrees Fahrenheit (30,000 degrees Celsius). It gives off mostly blue light,and its brightness can fluctuate wildly as a result of its dynamic nature andejections of outer layers of gas. Since stars that burn so brightly don't usually last verylong (they "live fast and die young"), V391 Velorum is expected todie violently in a supernovaexplosion after a total lifetime of about ten million years ? relativelyshort on a cosmic scale. V391 Velorum is illuminating one half of the nebulain a bright blue glow, while the other side appears shaded in a dusty red haze.Along the boundary between the two halves, scientists think new stars are beingborn in areas called HII ("H-two") regions, which are spots wherehydrogen gas has been heated up to the point that the atoms lose theirelectrons. Bright HII regions often denote areas of active starformation, where gas and dust collapse under their own weight and beginnuclear fusion, igniting as new stars. The new photo of Gum 19 was captured by an infrared cameracalled SOFI on the European Southern Observatory's New Technology Telescope atthe La Silla Observatory in Chile.